Somewhere between E3 and San Diego Comi-Con, a Kickstarter project raised over 5 million dollars, and is still going. 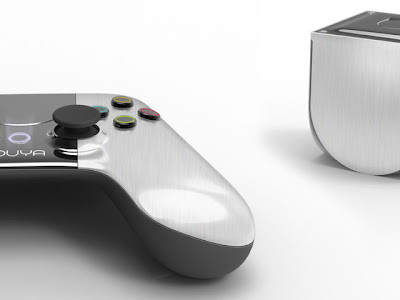 The Ouya Kickstarterproject (No I have no idea how to pronounce it yet) is a crowd funded home console. Embracing the idea of affordable and fun, The Ouya is a $99 console that is supposedly as open sourced as the internet. The development team behind the idea explained that the Ouya is a console where all games are free to play in some way and is open for hackers to customize to their hearts content. The console, running android 4.0, will be easy to root, uses no special screws, and is completely open source. The specifications are on par with a new and expensive Smartphone, containing a Tegra3 quad-core processor, 1GB of ram, and an HDMI connection for support up to 1080p. While still in the planning stages, there have been prototypes shown off and the funding for the system is growing. The possibilities here are quite interesting. The team behind the Ouya state that it will also have direct connections to online streaming channels like Twitch.tv. Since it is going to be open-source, anybody can program games/apps/tech for the console which allows for a lot of creativity and innovation, as well as a lot of bad games, buggy apps, and peripherals that don’t work. However it does look promising as the first game for the Ouya has been officially announced. A prequel to Human Element from Robert Bowling is announced as the 1st first-party title. At the moment all anyone can do is wait and see since the console itself is not going to be released for quite a while. But with already 5 million dollars in support and still 19 days before the project closes, it seems that people are hopeful that the Ouya will be a success.